Set the “Conversion Settings” (see above). Click the Browse button and locate the file on your computer and choose “Open”. Wait while file is being converted... (it usually take less then a minute). 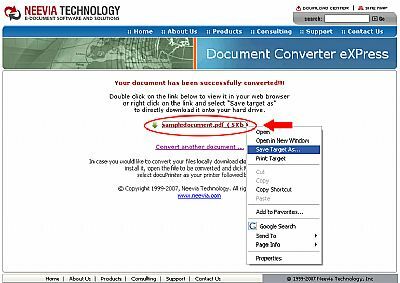 When the conversion is complete a link to the converted PDF file will be displayed (see above). When the “Save As” window pop-up opens, choose a place to save the newly converted file on your computer (e.g. My Documents, Desktop, etc.) and click the “Save” button. When the “Download” is complete click the “Close” button. The conversion is complete. 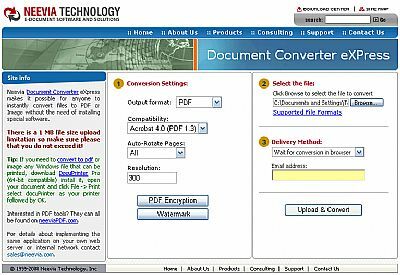 The original document has been converted to PDF format saved on your computer in the location that you specified.